Send us an e-mail by clicking here. We typically get back to you by the end of the evening. Sign up to receive tips, techniques, and notifications of classes and events. "I really enjoyed the class! It is going to be so much fun knowing how to use your rulers!! Can't wait for more !!" Mark cut and sew lines on big pieces of fabric. Sew big pieces of fabric together on the straight sew lines you have marked. Cut apart and trim multiple units. Perfect for the beginner or the experienced quilter. Watch all of the instructional videos for more detailed information how to use each ruler. Check back often – we have more rulers in development plus new Ruler Revolution patterns. 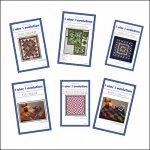 We also post instructions for using the Ruler Revolution rulers with many free patterns that come out in the quilting magazines. Become a Ruler Revolutionary today! From Josie Y. who attended classes during the Golden Needles Quilt Show in Conroe, Texas. I finished my Santa table runner and I have already used some Ruler Revolution rulers on my other projects. I really enjoyed the class and learned to appreciate the speed/easiness of using your rulers. I cannot wait to tell my quilting ladies from San Antonio about them. As a retired teacher, I really enjoyed your teaching method. You followed out methods: engage, explain, explore, elaborate, and our final product. You gave us individual attention, helped us when we made our mistakes, and never made us feel incompetent...in other words: YOU WERE GREAT! I am available for guild lectures, workshops, and retreats. Please email me at patti@rulerrevolution.com for available dates and fees. Sew first - cut apart finished blocks. Rulers are precision manufactured with slots to mark sew lines and cut lines on the fabric. The result is faster piecing, improved accuracy, and multiple units made with the patented Ruler Revolution rulers. Ruler Revolution rulers can be used with many, many patterns already on the market. Shop the Ruler Revolution designs written and illustrated specifically using our rulers. The pattern named Pinwheels in the Garden has an error on the top of Page 2. The 20 - 1 1/2" units should be cut 7 1/2" long and not 6 1/2" long. On page 62 of the Piecing the Ruler Revolution Way Book, the correct measurements towards the bottom of the page for the large rectangles are 5 7/8" X 11 1/2" if using the 24 in 24 Mini Half Square Triangle Ruler and 9 7/8" x 19 1/2" if using the large 24 in 24 Half Square Triangle ruler.